The Middle East, located at the intersection of Europe, Asia, and Africa, comprises the nations of southwest Asia and northeast Africa. Civilization began in this region's Fertile Crescent, which extends from the Tigris and Euphrates river delta to the shores of the Mediterranean Sea. The Middle East is the birthplace of Judaism, Christianity, and Islam, and the region has historically been plagued with religious and ethnic conflicts. Babylon and Jerusalem, two cities often mentioned in the Bible, are located in the Middle East. Fox News. Tuesday, 23 Apr 2019 16:03:46 GMT. A New Jersey Middle Eastern restaurant called NY Gyro King has come under fire for posting a job advertisement saying 'males only' on Saturday evening. Daily Mail. Tuesday, 23 Apr 2019 15:31:16 GMT. Middle East Map, showing Middle Eastern nations. Use the map menu below to display interactive maps of the Middle East, either in a frame on this page or in full-screen mode. The Middle Eastern region is home to vast petroleum reserves, major oil production facilities, and large oil refineries, which provide their host nations with enormous incomes. Much of the Middle East is arid, and the region's topography features extensive desert areas, rugged mountains, and dry plateaus. Water is in short supply, and agriculture often depends on expensive irrigation systems. The Middle East map below identifies the primary countries of the Middle East and shows their national boundaries. The term Middle East is actually an unofficial term which, in its most popular sense, includes the lands around the eastern Mediterranean Sea as well as Iraq, Iran, and the nations of the Arabian Peninsula. The term is sometimes broadened to encompass Libya in the west, the nations adjoining the Red Sea and Gulf of Aden to the south, and the nations abutting the Caucasus Mountains to the north. At the heart of the Middle East and its controversies lies the land of Israel, which is bordered by Lebanon and Syria to the northeast, by Jordan to the east, and by Egypt to the southwest. Several good sources for news about the Middle East region include CNN's, the New York Times', and the BBC's Middle East news sections. This Middle East map website also features political maps, terrain relief maps, and topographical maps of the Middle East. The detailed maps are sized to print on letter size paper, in landscape mode. Please note that these maps are provided for personal, non-commercial use only. 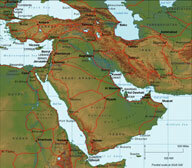 Middle East Maps - from the Perry Castaneda map collection.